This hearty and indulgent frittata was a hit at my Easter brunch! I served it piping hot out of the oven in a cast iron skillet. Very country-esque. It didn't brown as evenly as I would have liked it to but if I left it in the oven any longer the egg would have been over cooked,hmmmmm. Take a 12" cast iron pan and lay the bacon flat in it. Place the pan on the stove over a medium heat and brown the bacon until crisp on both sides. Remove the bacon and place it on a paper towel. Pour half of the bacon fat out of the pan. In the same cast iron pan add the olive oil and butter. Return the pan to the flame swishing it around coating the pan evenly. Add the garlic lightly browning it (takes about 2 minutes). Add the potatoes to the pan and lightly brown them for about 6 minutes tossing them often. Add the chopped scallion and asparagus to the skillet tossing the ingredients often until scallion and asparagus is lightly brown. In a large bowl whisk together the eggs, heavy cream, kosher salt and fresh ground pepper. Add half of the shredded Manchego cheese. Add bacon and continue to whisk. Combine the egg mixture into the pan and use a spatula to make sure the egg does not stick to the side of the pan. Cook it on the stove top for about 5 minutes. Take the cast iron pan and place it in the oven topping it off with the remaining shredded Manchego cheese. 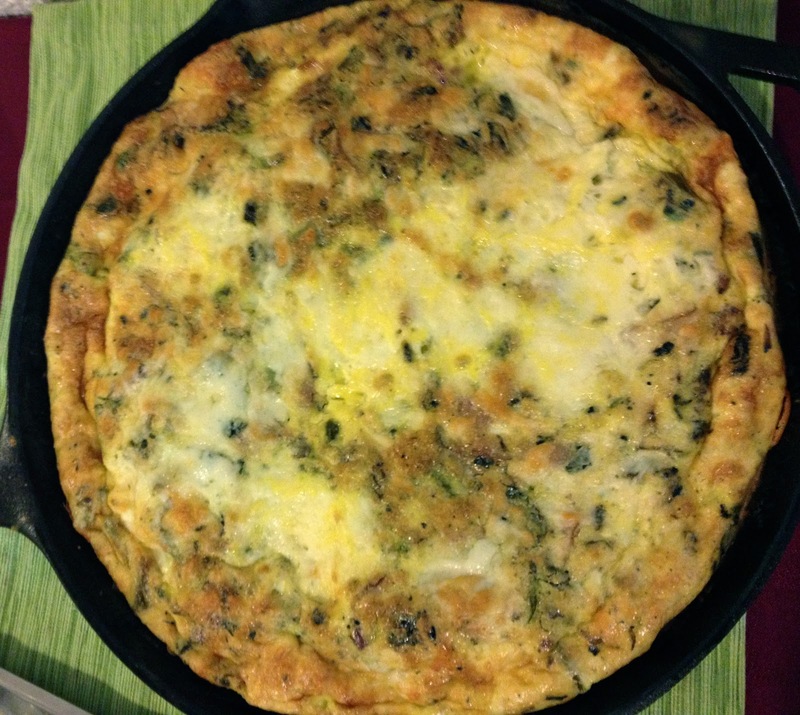 Cook the frittata until it is lightly browned on the top and cooked through or until you can stick a fork into it and it comes out clean when you remove it. About 15 minutes.